The best way to get accurate information about the drinking water in your area is to find the Florida drinking water analysis report that is required to be released to the public annually. Knowing where to find water reports, and more importantly how to read them, can give you crucial insight into how safe the water in your specific county is to drink for you and your family. Consumer Confidence Reports, or CCRs are annual drinking water quality reports generated by the water supplier specific to your area. They are put into action by the Environmental Protection Agency and are there to tell you where your water is coming from and what was found in it. 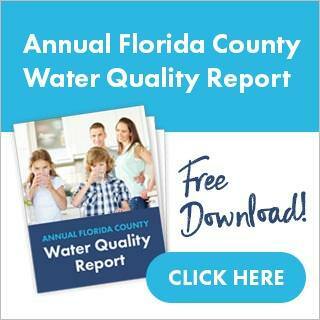 Click here to be directed to the Florida CCR page to easily find your county’s water quality report, or use our assembled list here. CCRs make it easy to understand exactly what is in your county’s water by breaking down the water quality report into comprehensive sections. Most will include a map highlighting the exact location of your water sources and explain the system the water goes through to get to your homes. The maps are usually followed by a table which breaks down all the levels of individual chemicals found in your country’s water followed by the likely source of contamination. Some chemicals you may want to keep an eye on include nitrate, sulfur, sodium, lead and copper. Included in the table is the MCL which is the the highest level allowed by regulation and the MCLG which is the goal for public health. Depending on the county, some CCRs may highlight contaminants they feel are are important for people to know about while others may include ways for residents and business owners to conserve water. Each CCR is different because all counties have different sources for their drinking water. Regardless of what your county’s annual water report includes, they are a great resource to stay in the know about the water your family consumes on a daily basis. The main purpose of CCRs is to keep the public aware that there are contaminants in their drinking water, and at Guardian Water Services, we can help you sleep better at night knowing that no matter where your water comes from, or what is in it, it’s being filtered through a four-part water refiner system delivering clean and refreshing water right into your home. To find out what is specifically in your water, schedule a free water quality test today to have one of our experts come out and test your water’s quality and receive a $50 retail store gift card.